GUARDRAIL POST PILE DRIVERS are commonly used for DRIVING IN guardrail posts, photovoltaic panel posts and wooden picket posts used in agriculture and the development of green spaces. 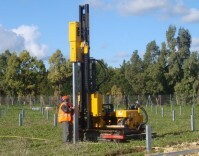 The self-propelled and truck-mounted hydraulic impact hammers have been specially designed to install guardrail posts, photovoltaic cell fields and wooden posts. This heavier duty solution delivers higher productivity from a single user.